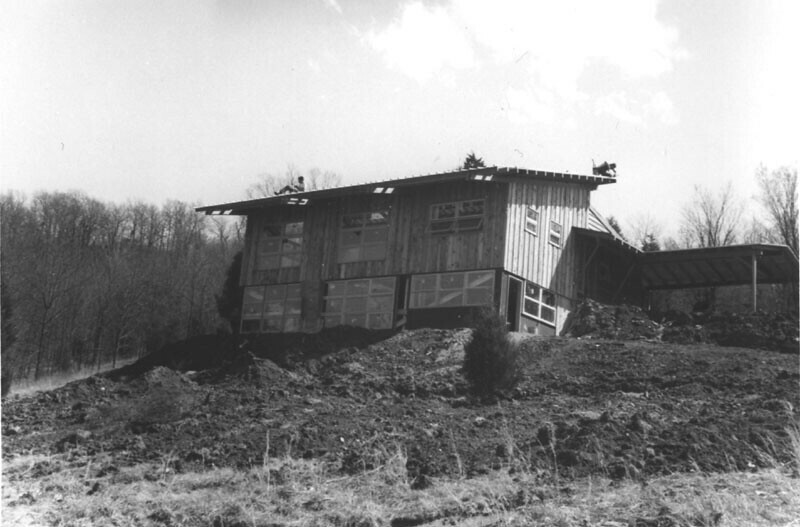 Stonebrook under construction in 1959. Photograph courtesy of Eva C. Kirkpatrick. On January 14, 2011, Harris Armstrong’s Stonebrook (1959) was listed in the National Register of Historic Places. This article is based on primary author Michael R. Allen’s sections of the nomination. The full nomination is online here. Near the tiny village of Antonia in Jefferson County, Missouri, just north of Highway M and hidden in the forested hills, is Stonebrook. This small house is an excellent, unique work designed by St. Louis architect Harris Armstrong but whose origin is equally due to naturalists Kemps and Eva Kirkpatrick. 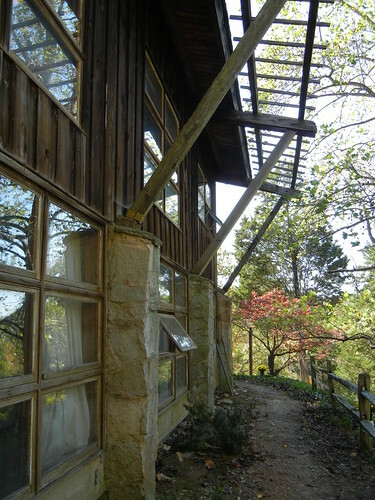 Armstrong (1899-1973), whose reputation as a master of Modern architecture is well-established nationally, designed the house for the Kirkpatricks after they purchased the Stonebrook Forest in order to protect its wooded wildflower preserve. Due to the compact size, limited budget and design economy, Stonebrook was a singular achievement for the master architect. Yet Stonebrook’s design principles are also found in Armstrong’s larger, more costly residential designs. A National Register of Historic Places dedication event was held at Stonebook on October 9, 2011. Overall, Stonebrook is a very simple wooden house evocative of rural Swiss and Swedish residences. The house departs from Armstrong’s documented body of Modern residential designs in size as well as extent of owner involvement in design and construction. The Kirkpatricks had purchased the land to protect Stonebrook Forest and needed to live on the property for financial reasons. Their limited budget of $20,000 was first rebuffed by the great architect but quickly seized as a challenge. Stonebrook shows the same deliberate attention to design and sensitivity to site as his larger residential designs. When the glaciers moved down from the north to northeast across the American continent during the Ice Age, there were two places left undisturbed – the southern Alleghenies and the Missouri Ozarks. Geological maps show glaciers stopped near Rock Creek Road in Jefferson County, eight miles north of Stonebrook Forest. Because of the passage of the glaciers, plants uprooted by the flow strived to survive ahead of it. Many of these plants, including the reindeer moss and walking fern, are still plentiful at Stonebrook Forest along with a majority of all wildflower species found in Missouri. 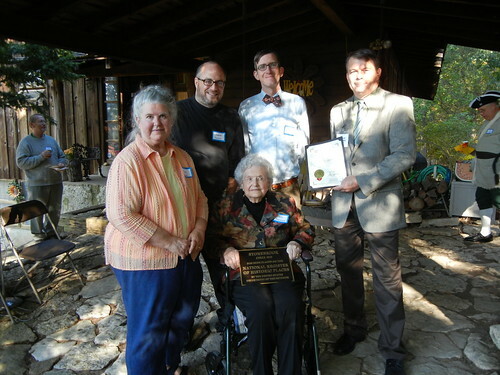 Not only did the Gilliams wish to set up the Girl Scout camp at Stonebrook Forest, but also they wished to preserve the wildflowers from theft and destruction. By the end of 1939, the Gilliams had purchased 100 acres of Stonebrook Forest from Louis Kohler, son of the homesteader who first owned the land. Later Helen Hull mentioned Stonebrook Forest in her 1952 book Wildflowers in Your Garden. 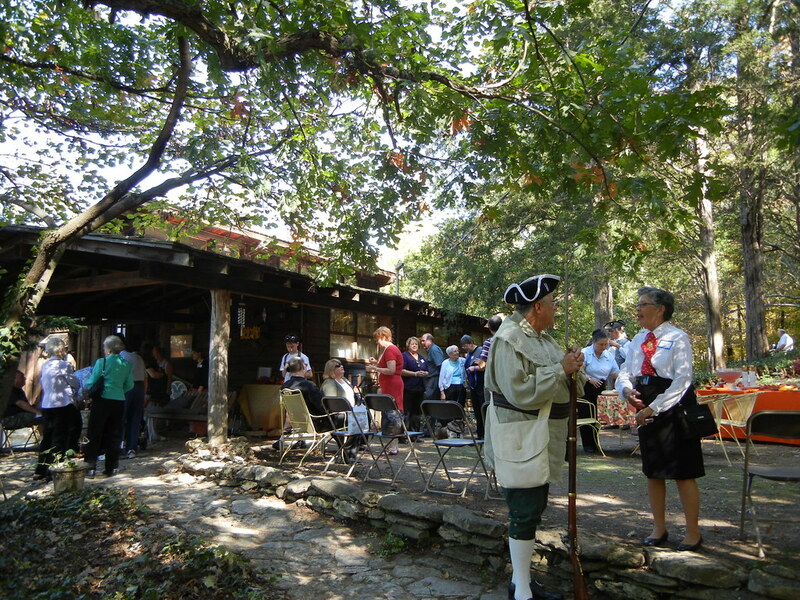 Hull chose Stonebrook Forest as her example of the most beautiful wildflower preserve in Missouri, which certainly elevated recognition of the land. Around this time, the Gilliams were acquainted with a couple from Kirkwood, Kemps and Eva Kirkpatrick. Kemps Kirkpatrick was a pharmacist and Eva Kirkpatrick was a medical researcher with a pre-medical degree from Washington University. The Kirkpatricks volunteered for the Missouri Conservation Department and the Audubon Society to care for injured owls, hawks, eagles and other birds. The Kirkpatricks were also interested in wildflowers and protecting Missouri wildlife and wildflower habitats. In need of a suitable location for release of the birds under their care, the Kirkpatricks purchased nearly 16 acres of Stonebrook Forest from the Gilliams in 1956. The Kirkpatricks did not have the means to maintain a residence separate from their new land, and soon after purchase decided to build a house there. Persistence would lead to the involvement of Harris Armstrong. 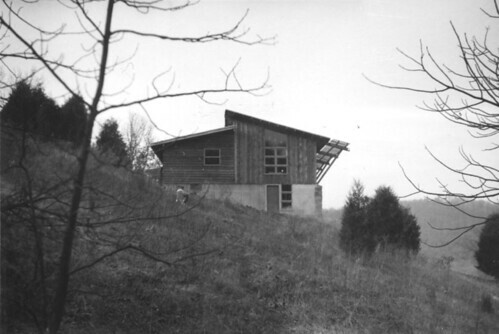 In 1957, Eva Kirkpatrick toured Harris Armstrong’s Stockstrom House and, enthralled with its modern form, decided that she would like to have Armstrong design the house at Stonebrook Forest. The Kirkpatricks arranged to meet with the famous architect, by then the most significant modernist designer in St. Louis, who had lived and worked in Kirkwood since 1938. The couple explained their circumstances and their likely $20,000 budget to an architect whose residential portfolio included no houses even close to the cost range offered by the Kirkpatricks. In her manuscript on Stonebrook, Eva Kirkpatrick writes that although Armstrong attempted to rebuff the couple, he was impressed with the site and with their work with birds, which he had read about in the newspaper. During discussion of the Stockstrom House in St. Louis County, recently published in House Beautiful, Armstrong asked the Kirkpatricks if they realized that such a house could cost $100,000 to build. Kemps Kirkpatrick countered that the architect could “give us a watered down version for less.” Armstrong pondered the challenge, and told the couple that if they had time they could do construction work themselves or if they had money they could get a larger house — but the busy Kirkpatricks seemed to have neither. He then asked the couple what they wanted in a house, and proceeded to nearly execute the design on the spot during conversation. 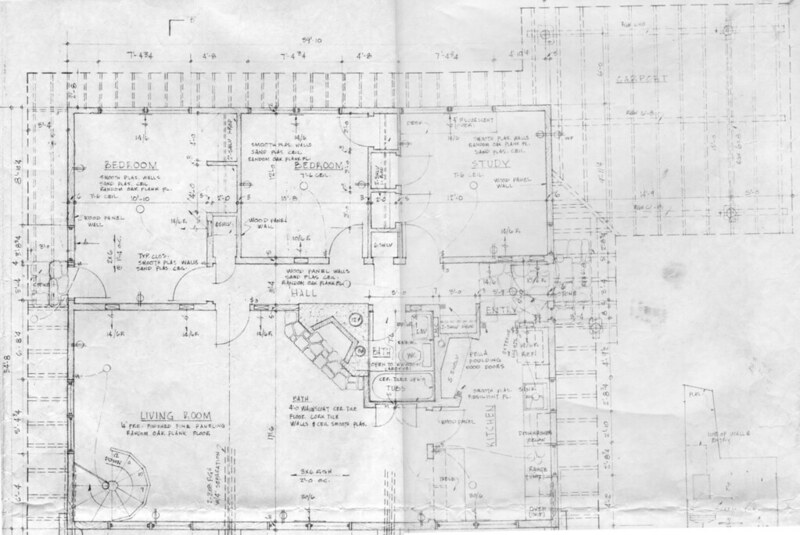 Remarkably, Armstrong’s sketch during the first meeting is very close to the final plan for Stonebrook. Western elevation drawing for Stonebrook, by Harris Armstrong. Courtesy of Eva C. Kirkpatrick. Armstrong asked the Kirkpatricks how many rooms they desired, what finishes they wanted and such. 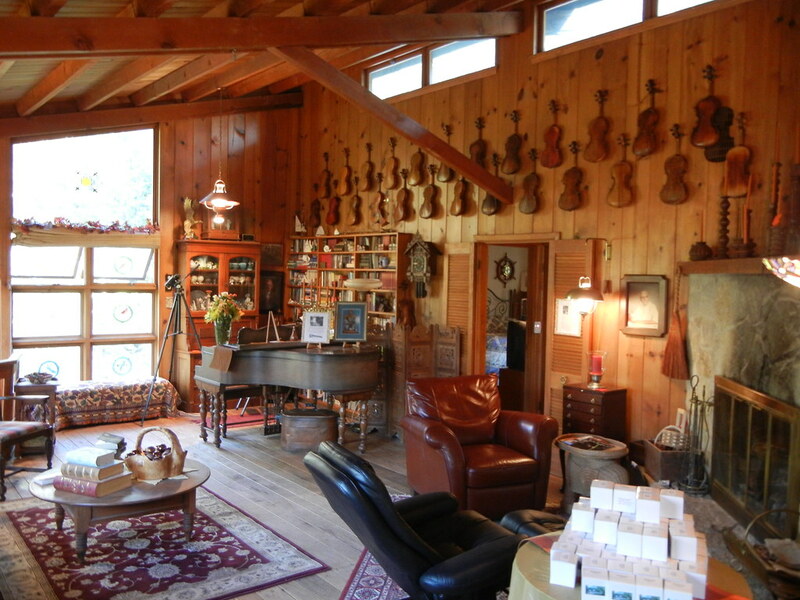 He inquired about their hobbies and interests, and gathered details such as their need for a bird laboratory, storage for a 4,000-book library and a collection of 25 violins. 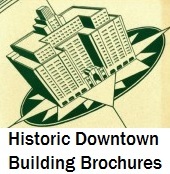 These details were later supplied in a one-page summary memorandum to the architect. With a road to the Gilliam’s cabin and electric lines already on the site, utility and road costs were smaller. Eva Kirkpatrick had already priced the cost of a well at $1,000. Armstrong took in the information, and then abruptly told the couple that “I don’t design houses under $60,000.” Then he stated that he was going to take on the project regardless, and showed the Kirkpatricks a pencil sketch of the house. Armstrong joked that “let’s say, it’s for the birds” and later would refer to Stonebrook as the “Baby House” to the Stockstroms’ “Mother House.” On February 26, 1958, Armstrong signed an agreement with the Kirkpatricks to prepare plans for the house at a sum not to exceed $500. After its details were refined in subsequent drawings, Stonebrook matched the Kirkpatricks’ needs and Armstrong’s imagination and acumen. Stonebrook would be no miniature Stockstrom House, but rather a unique work of spatial economy by a master architect used to working on a larger, grander scale. Armstrong and the Kirkpatricks collaborated heavily on the design in order to accommodate the couple’s financial ability and well-defined desires for their lifetime house. The extent of collaboration was unusual for Modern Movement houses of the time. Armstrong visited Stonebrook Forest with the Kirkpatricks and, according to Eva Kirkpatrick, selected the site for the house on intuition. Harris Armstrong was convinced that he had found a site free of large stones, quite unusual in the Ozark foothills. The architect was proven right when excavation in summer 1958 turned up few stones. Armstrong embraced the slope of a major hill, which allowed for the lower level to have a well-lit living area as well as a back space in the hill for laundry and storage. 1959 view of Stonebrook from the east. Photograph courtesy of Eva C. Kirkpatrick. Stonebrook’s design showed Armstrong’s intuitive, non-dogmatic grasp of Modern Movement treatment of the small house and the natural character of the site itself. 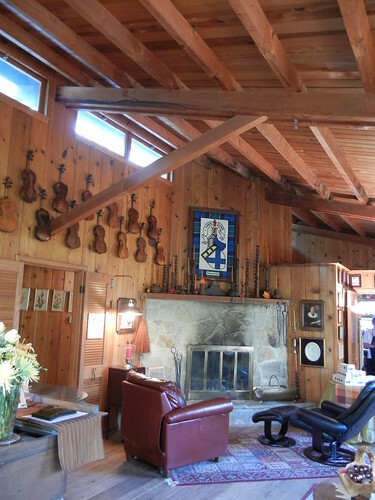 Stonebrook utilized a square plan of 42′ by 42′, making use of both the lower and main levels for living space. The basement was concrete but faced in stone found on site on the fully-exposed north side, and the house had both vertical and horizontal weathered cypress siding. 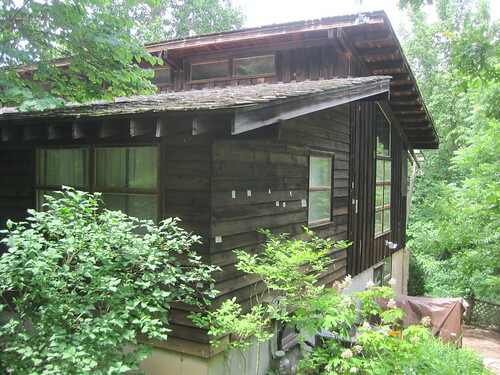 The siding showed Armstrong’s ability to express necessary building materials aesthetically. The exterior cladding was simple and appropriate to the wooded, rocky site, but provided differentiation to break up the square box shape. The house was divided roughly into two parts corresponding to the public and private spaces, with a split roof of two levels with slopes in different directions. The north side, with more light in its monumental fenestration that provided expansive shaded views, housed the living room and kitchen under 16′ sloped ceilings, and was clad in vertical siding. The south side housed the hall and three bedrooms, and had more traditional weatherboard siding and limited fenestration. The different roof levels allowed Armstrong to light the living room and kitchen further with a clerestory on the south side. The roofs were clad in gravel and large flat stones found on site by the Kirkpatricks. A simple attached wooden structure on the west was supposed to be a carport, but the site slope posed a major problem in inclement weather. The carport was repurposed as a porch after construction of Stonebrook. The sloping site also provided Stonebrook with a dramatic presence far out of proportion to its size. Armstrong seized that presence, and articulated the north face — the side on the down slope of the hill — with three bays of grids of modern wooden Pella single-pane windows. 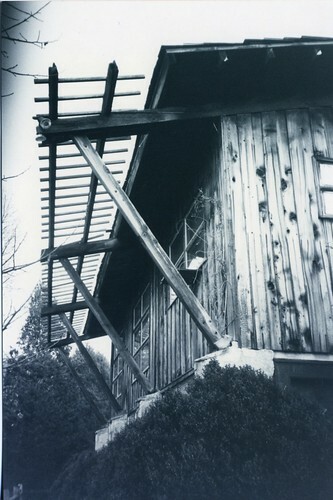 Above, a simple redwood trellis supported by three diagonal supports extending from the house provided shade as well as decoration. Armstrong placed another major bay of windows on the living room’s east end, but gave the other rooms of the house fewer windows for greater privacy. Floor plan for Stonebrook’s main level. Courtesy of Eva C. Kirkpatrick. The architect placed the main entrance off of the carport, rather plainly. Inside of the entrance, a visitor was placed on a rough stone floor in the long hall, with a doorway at left leading to the kitchen. Separated from the kitchen by a wall that did not extend up to the ceiling was the spacious living room. The progression of spaces started in the dimly-lit, rock-floored foyer and low-ceilinged hall led toward more light, warmth and space in the kitchen and living rooms. This sequence suggests the passage of seasons and other natural cycles. Armstrong left the roof deck boards, rafters and beams exposed in the kitchen/living area, clad the walls in 12” pine paneling and specified an oak shipdeck floor. The wood finishes provided warmth and simplicity: each piece of wood served a function, an act that saved costs. In the center of the room in the floor was an electric outlet and metal hook on the room’s center beam. These have allowed the Kirkpatricks to place a large Christmas tree in the living room each winter. View inside of the house looking at the fireplace. Inside of the living room in opposite corners were major features, one descending through the floor and the other ascending to the ceiling. In the southwest corner was a chamfered fireplace that rose halfway up the wall and was faced with stone that the Kirkpatricks gathered on site. This fireplace had a counterpart immediately underneath in the less formal room on the lower level. The Kirkpatricks assisted the mason in building both fireplaces. In the northeast corner, Armstrong placed the only staircase. To save space and money, he designed an open spiral staircase. Again, however, he looked for a way to express the site’s nature, and selected a tree trunk on site to serve as the post, in which oak treads were joined. The staircase originally was open with rails on the walls, but the presence of children led the Kirkpatricks to add a partially open balustrade for a shield. On the wall opposite the staircase, Armstrong provided built-in bookcases and planned permanent installation of the violin collection on the only tall, uninterrupted surface of the home. View looking southeast across the living area. While much of Stonebrook’s space was finished very economically, Armstrong included thoughtfully designed amenities throughout. The kitchen features a wide opening with louvered doors framing a built-in picnic-style table and open cupboard above. The built-in table saves space and adds an unusual detail. Down the hall, Armstrong had the rear of the fireplace exposed and stone-clad to disrupt the monotonous corridor and suggest the presence of the expansive living room on the other side. The unusually tall bathroom is inside of the northern section and has a 16′ ceiling and clerestory window. Armstrong chose the bathroom’s botanical wallpaper, based on illustrations in a book in the Kirkpatricks’ library, to honor Stonebrook’s wildflowers. Downstairs, the living room features stone-clad piers between the window bays on the interior. Overall, Armstrong made every effort to combine economy and deliberate design. Although of a smaller size and budget than Armstrong’s other works, Stonebrook employs Armstrong’s essential residential design principles for Modern homes. 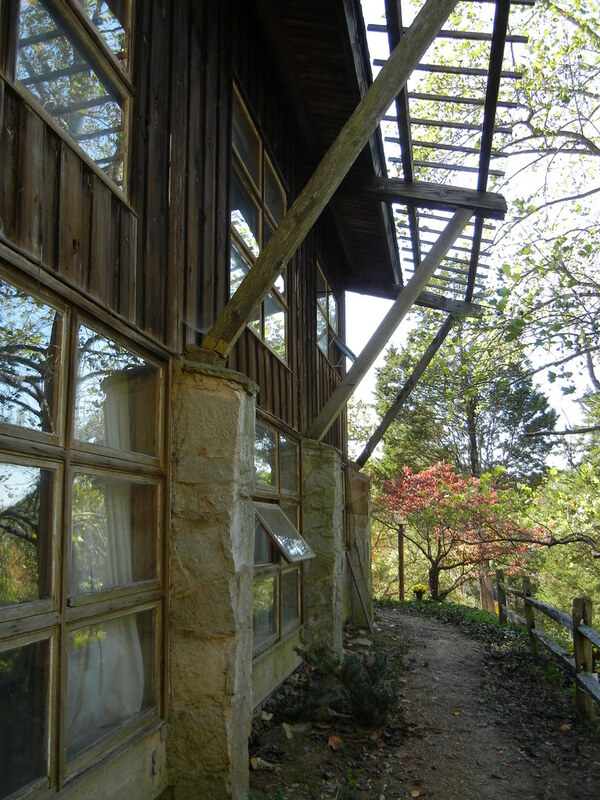 The use of stone on the foundation and unpainted wood for siding are typical of Armstrong’s work in this period, as is the emphasis on natural light and sun screening built into the building. Like other residences that Armstrong designed in the 1940s and 1950s, Stonebrook has a prominent symbolic decorative element in the north side trellis to visually connect the house to the sky above. Furthermore, Stonebrook originally was to have a carport at its entrance, which sheltered vehicles in a straightforward manner. Stonebrook also articulated Armstrong’s interior design principles, with bedrooms, bathroom and hall minimized to provide more space to the open kitchen and living area. Although there was no formal dining area, the built-in dining table in the kitchen with its folding door dividers was in keeping with the treatment of breakfast areas in his larger houses. The modest element set a convivial, informal tone for visitors to the house. Undated view of the north elevation showing the trellis. Courtesy of Eva C. Kirkpatrick. Armstrong and the Kirkpatricks described Stonebrook as having much in common with Swiss or Swedish rural houses. Yet there also are key similarities to small houses built in St. Louis County in the 1950s that employed Frank Lloyd Wright’s Usonian design principles. 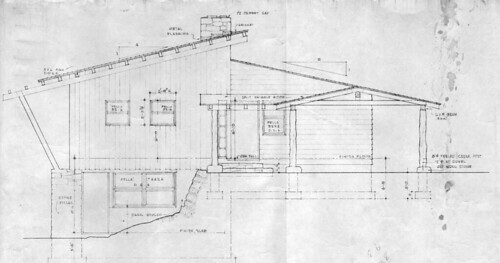 For instance, the Harry Hammerman House, designed and built by its namesake, makes use of a prominent sloped roof over an open living space, placement of bedrooms in a lower-ceilinged private space, strongly contrasting fenestration between public and private spaces, use of building elements to provide sun screening, built-in furniture and exposed structural elements. Such economy was popularized by Wright and fit well with the Modern Movement’s emphasis on direct expression of form and material. However, Stonebrook diverges from its peers in several ways. With over 1,700 square feet on each level, the dimensions are far more spacious than some of the compact Modern houses built in the 1950s. Armstrong did not embrace extensive use of mass-made materials, as did Hammerman and others, but saved money through unique specifications of commonly used natural materials like owner-harvested stone and planing-mill lumber. Stonebrook viewed from the south. Armstrong’s sensitivity to the site gives Stonebrook the clear mark of this master architect. Many Modern houses in St. Louis avoided grading or major disruption of site features, but few brought the indoors and outdoors into such symbiotic harmony. At Stonebrook, Armstrong placed the house in a site he selected intuitively so as to not greatly disrupt the overall setting. Nonetheless, the site emphasizes the intervention of the residence in Stonebrook Forest. Armstrong designed the house to become part of Stonebrook Forest through the use of structural and symbolic elements of the setting in the architectural design. Materials brought to site, like the oak and cypress lumber, were largely used fully exposed — no concrete or wood was painted — to showcase natural beauty. As a result, the house is as fully Modern as it is fully natural. Many Modern designers attempted such balance with small houses around St. Louis, but few achieved anything on par with Stonebrook. 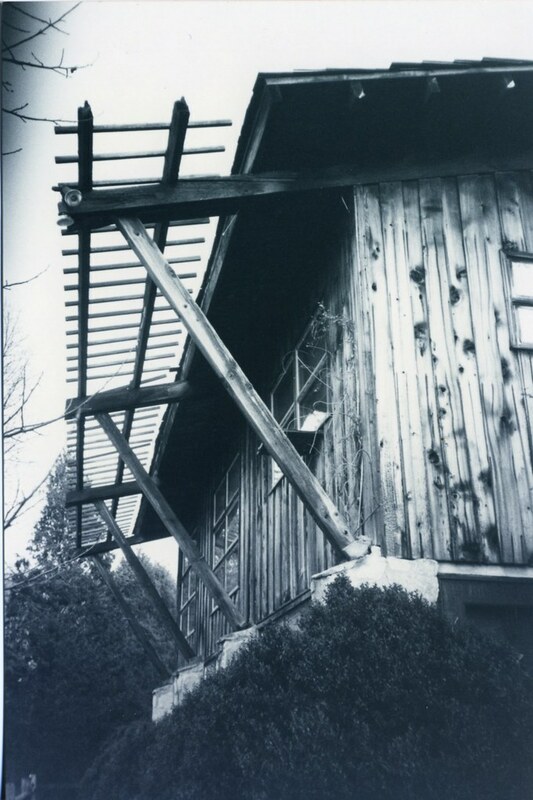 Furthermore, at Stonebrook Armstrong achieved an honesty of structural expression that was central to the principals of Modern Movement architecture. Armstrong himself would never again undertake a “house under $60,000” but Stonebrook shows that his great talent was well-suited for such a constraint. Upon completion, construction cost less than $20,000. Armstrong’s embrace of the ecology of Stonebrook Forest was the result of an unusual collaboration with Kemps and Eva Kirkpatrick. The Kirkpatricks moved into Stonebrook on April 15, 1959. The fireplaces were yet to be built, and Eva Kirkpatrick remembers having to keep her four year-old son away from the triangular opening in the living room. Today, Stonebrook remains under the ownership of Eva C. Kirkpatrick. There have been very few changes to the house and property. 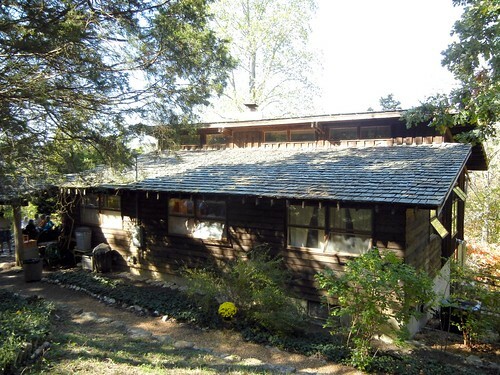 One addition is the Tree House, built in 1982-3 and designed by Ty Trueblood. Trueblood’s design of an open garage with observation deck above is sensitive to Stonebrook’s design and uses the same vertical siding, but it is not architecturally significant. 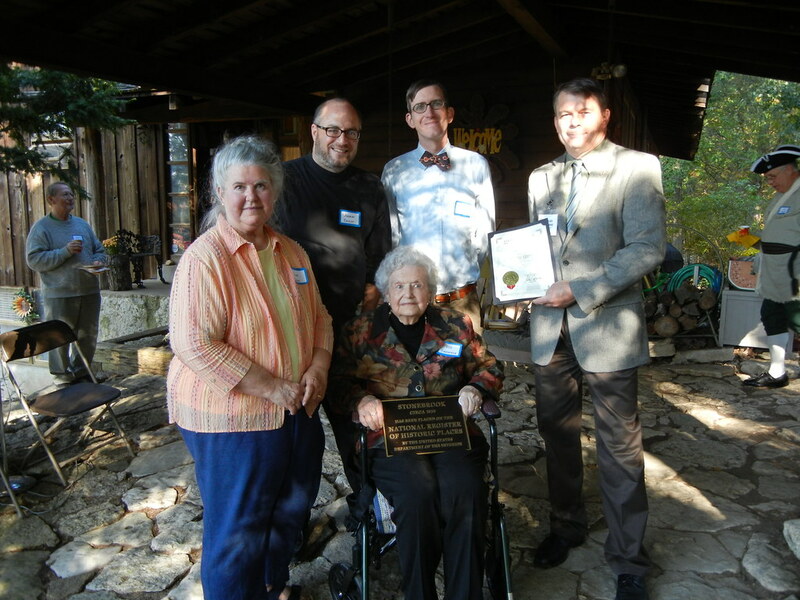 Glee Naes, Andrew Raimist, Michael Allen, Jefferson County Council Vice Chairman Charles Groeteke and Eva C. Kirkpatrick with the dedication plaque for Stonebrook. Besides the change of one door and the replacement of the roof material, no notable alterations have occurred to Stonebrook. After the house was listed in the National Register, Eva Kirkpatrick passed away in 2012. Eva Kirkpatrick’s daughter and son-in-law currently resident at Stonebrook, and will pass the house on to their daughter. The joined legacies of regional modern architecture, wilderness preservation and one family’s heritage will live on for ages at Stonebrook Forest.